I am starting to think about how I can make some changes. Yes, the little wheels are spinning around and the ideas are just flowing. Its so exciting!! I just love changing things around because it helps you to take stock of what you have and you are able to downsize some of those things that really you just don’t use and don’t need. When you have a small space it is so important to just keep what is beautiful, sentimental, useful or you just love it and it makes you happy. So, I am planning to move a kitchen hutch to the living room where it seems it will fit and this is to begin to get ready for a big renovation of walls coming down in my house. Yes, it is time for it to become much more of an open concept because my rooms are just so small. I really want more of a comfortable entertaining area. I also have the idea of a few open cupboards in my kitchen. I have seen this in magazines and it looks really nice especially if you have nice dishes that are displayed in an organized fashion. I opened my cupboards to see what it would look like and eek….there is some work ahead. However, I don’t think this would really be an expensive update as it is just a matter of taking the cupboard doors off, removing the hardware and painting the shelves. Of course, I will also have to downsize and/or organize all the things in there that do not look so attractive. 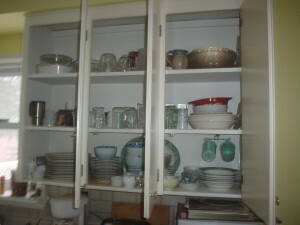 This entry was posted in downsize, organize, Re-organize. Bookmark the permalink. We recently took the doors off our kitchen cupboards and I really like it. So easy to access everything. At the same time we made a pantry out of a closet off the kitchen so all the grains and beans are on shelves and all the pantry items are in a cupboard. So the kitchen cupboards have mostly the nice dishes it. No more opening and closing the doors and watching our heads as we unload the dishwasher. We bought some decorative trim to put on the edge and face of the cupboard frame. Looks nice. I fully support you in taking off those doors Kim! Great ideas Kim!! Let me know if you need any help. I can’t wait to see what it looks like. Happy organizing!